Cap Size - 7 1/2. 50th anniversary caps in honor of the mothers of Stephen Piscotty and Yuseiro Petit. Game used on May 7th, 2018. Net proceeds benefiting the ALS Therapy Development Institute and Yusmeiro Petit's Nonprofit organization of choice. 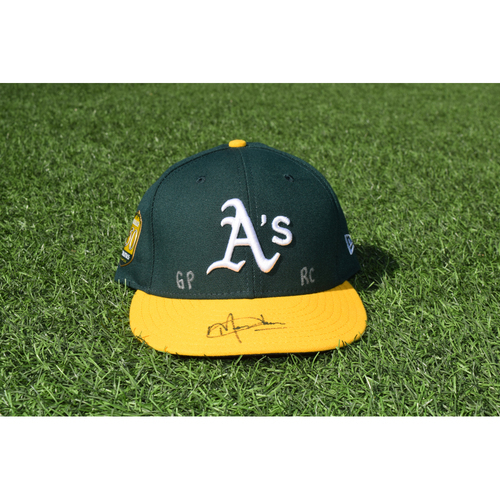 The Oakland A’s Community Fund supports charitable organizations in improving the quality of life for people throughout the Bay Area. Specifically, to fund endeavors to improve educational programs, aid the underprivileged, assist in crime and drug prevention, promote health awareness, and champion children and senior welfare. The A’s Community Fund believes in the need to invest in the community’s future.